Artist Amanda Herbert putting the finishing touches on the Chorus box in Leamington, the sixth box she has decorated in Cambridge. 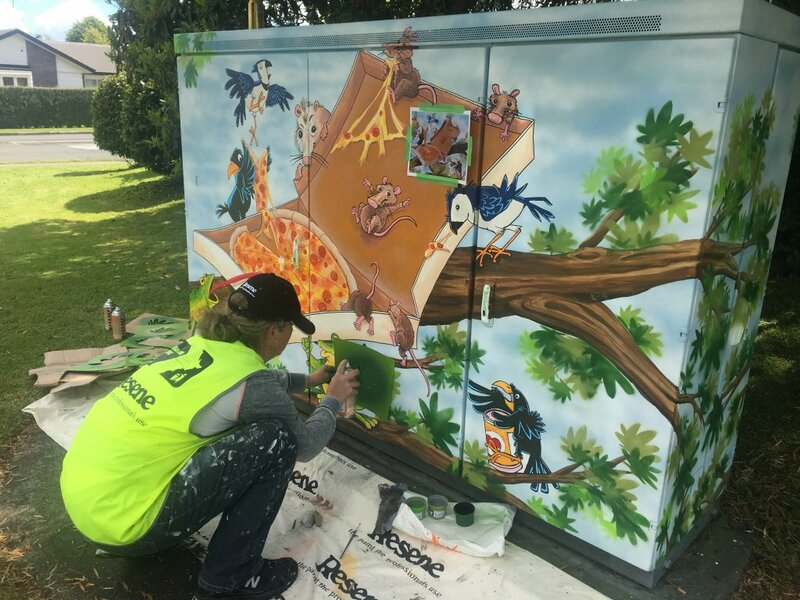 Artist Amanda Herbert has been at it again, livening up a telecommunications cabinet in Leamington as part of a Keep New Zealand Beautiful initiative. Her latest project, sits on Shakespeare St near the corner of Browning, and features an assortment of adorable critters getting stuck into a pizza up a tree. Last year, the Hamilton artist jazzed up five of the Chorus boxes around town, but only had one approved this year. As well as beautifying communities, it is hoped that the art will deter vandals who would otherwise see the cabinets as a blank canvas for graffiti. Designs had to be submitted by the artist and approved by Chorus, with successful applicants receiving between $400 and $1500 to cover the cost of paint, drop cloths and other expenses.